My older girls picked up their knitting needles this week. They have big plans of what they can make with one ball of yarn and two thick needles: Hats with pom poms to match stripey scarves for every family member and friend. For now, I tell them: Keep it simple. Practice the steps, row after row. No need for fancy patterns or agendas. Just stitch after stitch until they are even and right. We’ve corrected our fair share of lost stitches, tangled yarn and strangely elaborate knots. Mostly, though, we’re fighting against extra. I started my oldest girl out with 15 little loops and within 3 rows, she’d nearly doubled the length of her project. I counted them out—27 stitches now. We counted out 5 stitches for my next daughter and she immediately increased that to 10. It’s not purposeful, of course. Just an inadvertent grabbing of yarn in the wrong place, slipping on two loops where there should be only one, until finally their project has doubled in size. And if I let them continue unhindered, it’d triple and more. So I pull out the row and start them again. This is how you grab just one loop at a time. This is how you count your stitches after each row. But it’s just so easy with momentary distractions and the way we pick up speed to do this, too. 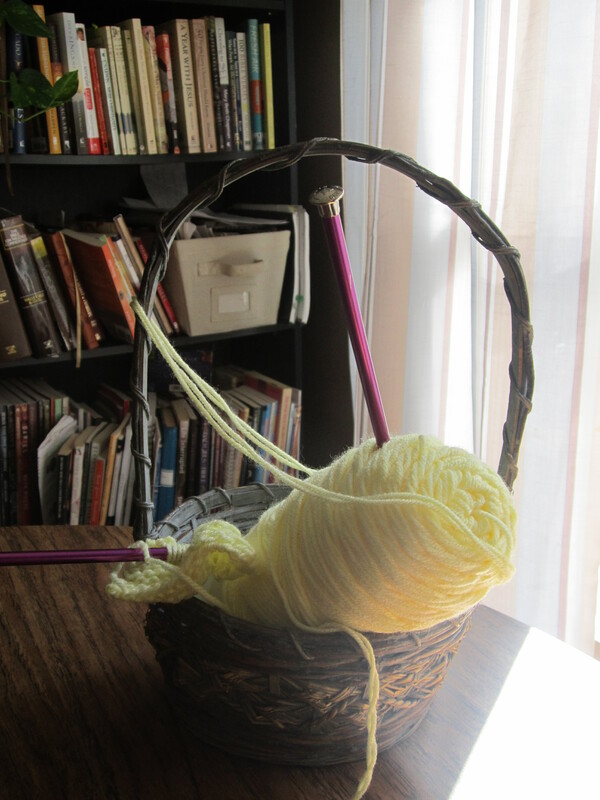 God starts me out with 15 simple loops of yarn. He establishes the rhythm and the pattern, and He measures out the resources so I’ll have enough for all I need. I focus at first and watch each stitch carefully. Then I begin to rush and think about other things. People ask me questions. I look away instead of on my project. Somehow I’ve slipped on extra stitches. God asked me to do 15. Just 15. So simple. He gave me enough. But now I have 30 and I’m frantically working, trying to keep up with it all. I’m running out of resources and fretting over how I’ll ever be sufficient for all this need. When I finally hand over the tangled mess to this patient and gracious God, He takes me back, eliminates the excess and starts me over again. Just 15 stitches, Heather. I only asked You to do these. No more. Nothing extra. And I’ve given You all You need, more than enough, for this alone. It’s busyness, of course, that rushes us into grabbing more. We say “Yes” when He wants us to say “No.” We feel pressured into volunteering and there’s the pride that convinces us that we can save the day and make it successful. Usually, it’s all good things: Bible studies, meetings, committees, volunteering and relationships. Then we find ourselves doubling up those stitches again, and when we read those words of Jesus, they don’t even make sense. How could He promise us this when we feel so worn? There’s another way, though, that those stitches slip right on and we don’t even know it. It’s not busyness; it’s expectations. We tell ourselves what a Good Mom, a Good Wife, a Godly Woman and a True Friend does. We’ve condemned ourselves right there, always trying to measure up to some perfect standard, tossing on stitches until we just collapse in failure and then we feel it: I’m a failure and a mess. I can’t keep up with it all, even these 15 stitches. Not like “her,” so perfect and together. But God didn’t ask us to be perfect. He doesn’t impose impossible standards or withhold grace. “Are you tired? Worn out? Burned out on religion? Come to me. Get away with me and you’ll recover your life. I’ll show you how to take a real rest. Walk with me and work with me—watch how I do it. Learn the unforced rhythms of grace. I won’t lay anything heavy or ill-fitting on you. Keep company with me and you’ll learn to live freely and lightly(Matthew 11:28-30 MSG). It takes purposeful determination to protect the few stitches God’s entrusted to us, to fall into those unforced rhythms of grace rather than frantic rushing and condemnation. No slipping on extra loops of string, not with busyness and commitments or expectations and burdensome requirements. Protect what He’s asked You to do and do it well, with all Your heart and mind, knowing that He’s given you all you need for just this much and no more.